My son wanted me to make Burritos for dinner. Now I am no expert in Mexican cooking, but I have started cooking it now and then as I love the flavour. So I looked up a recipe and gave it a go. This to me is like tacos but with the soft tortilla, not the hard corn shells. It was really easy to make and my kids loved it, so did I. What I did discover as this is the first time I made the seasoning mix from scratch, as opposed to buying the taco making kit, is that the amount of spices you add, depends on how much you like it. So where I have given you set amounts below, it is probably the minimum amount of spices you need to add. If you like it to have more cumin or coriander flavour add more, if you like it spicier add more chilli powder, it really is a to taste recipe. So start with the basic recipe, then add more spices if you feel you need it. If I have a yellow capsicum in the house, I use that instead of red, makes no difference. With the mince use your favourite, I quite like it with a combination of pork and beef mince also. This is super easy to make and has a lovely flavour, and best of all, very quick to make. Heat oil in a large frying pan over medium-high heat. Add the onion and garlic, cook, stirring occasionally, for 5 minutes or until the onions have softened. Add the mince, cook, stirring for 3-5 minutes, breaking up lumps, until the mince has browned. Add the cumin, coriander, paprika and chilli powder. Cook, stirring, for 1 minute. Add the tomato paste and capsicum, cook, stirring for 1 minute. Add the tomatoes and stock, bring to the boil, reduce the heat to medium-low, simmer, uncovered, for 10-15 minutes or until the sauce has thickened. Stir in the beans and coriander. 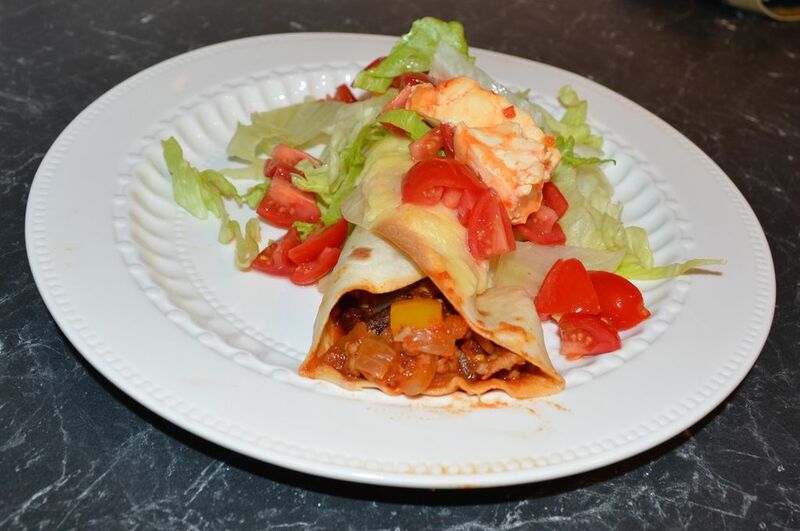 Wrap the tortillas in aluminium foil and heat in the oven for 10 minutes. Divide the mince mixture between the tortillas, you want to spread it along the centre. Roll up to enclose the filling. Place in a large, greased baking dish. ( I like to place a spoon on the tortilla as a weight to stop them opening while I prepare the rest of the tortillas). Remove spoon, then sprinkle with cheese. 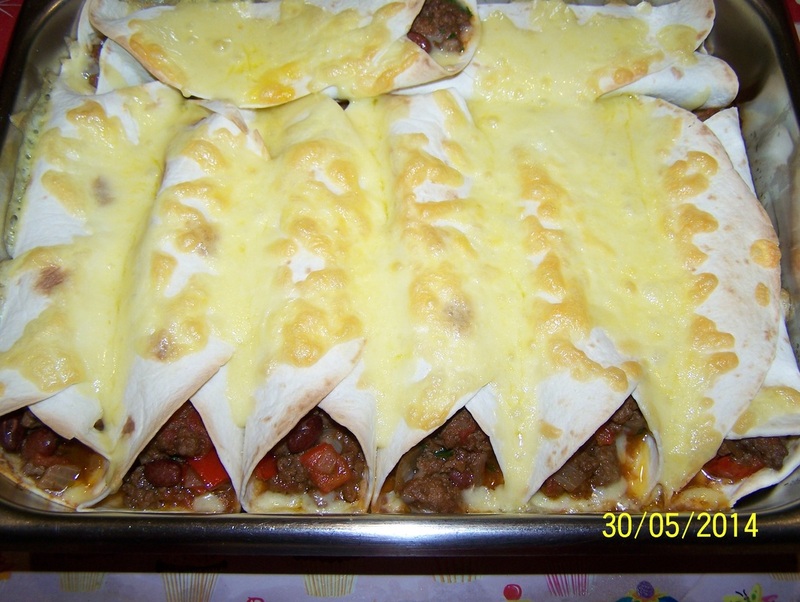 Bake for 10 minutes or until the cheese melts and the burritos start to brown. 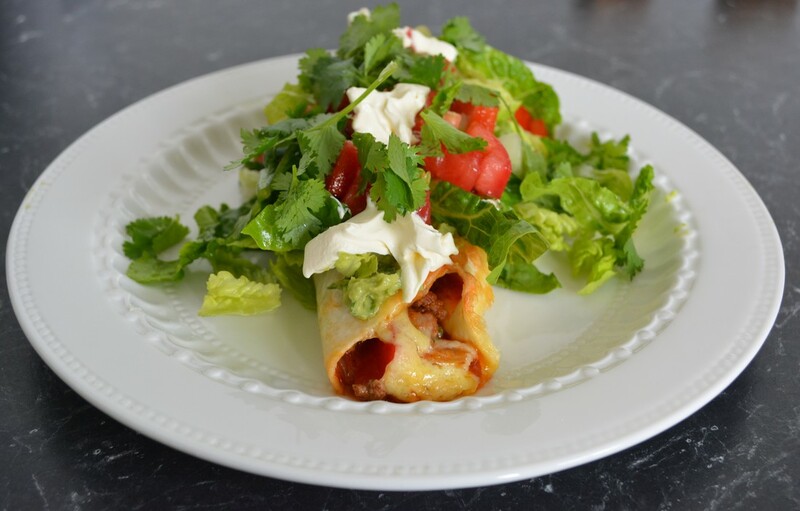 Serve immediately with sour cream, shredded lettuce, guacamole and some chopped fresh tomatoes.